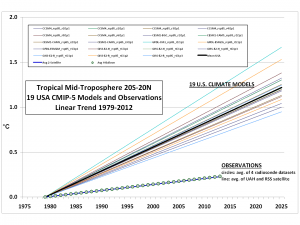 Climate Models: “Epic Failure” or “Spot on Consistent” with Observed Warming? NASA scientist Roy Spencer recently posted on his Web site some startling graphs produced by John Christy, his colleague at the University of Alabama in Huntsville. 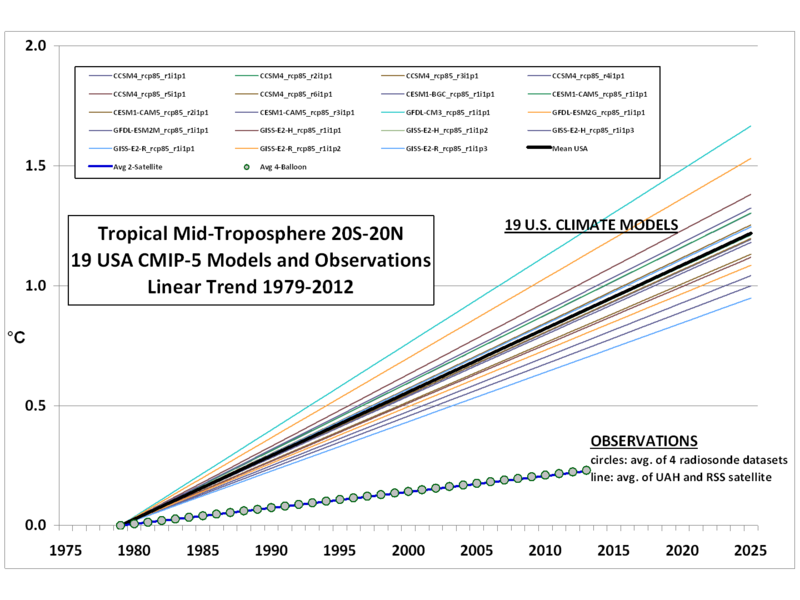 The graph immediately below compares the linear-trend temperature projections of 73 climate models with the linear trend of observed temperatures for the bulk tropical atmosphere during 1979-2012. 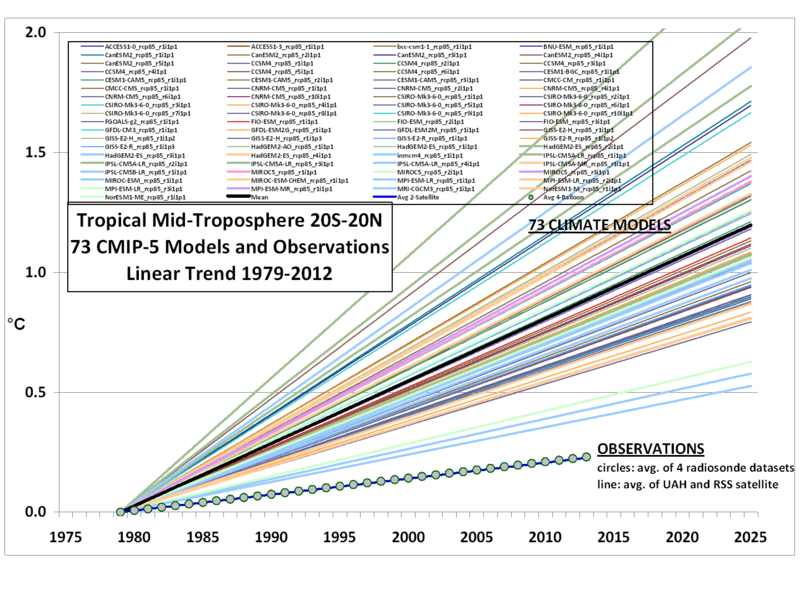 The 73 models are part of the fifth phase of the Coupled Model Intercomparison Project (CMIP-5), a collaborative effort of 20+ modeling groups to inform the IPCC’s forthcoming Fifth Assessment Report (AR5). 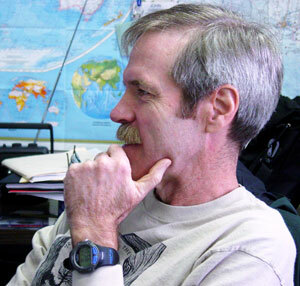 The Project’s three main objectives are to “evaluate how realistic the models are in simulating the recent past,” “provide projections of future climate change” out to 2035 and 2100, and “understand some of the factors responsible for differences in model outputs” such as different estimates of feedback effects. 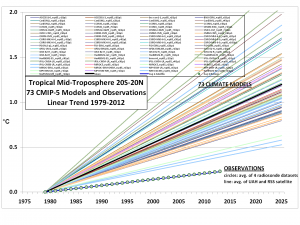 Christy’s graph reveals what Spencer calls an “epic failure” of the models to match the actual behavior of the tropical atmosphere. Models that overestimate recent warming are likely to overestimate future warming as well. What about the subset of U.S.-designed models — do they get the trend right? Nope. Take a gander at the next graph. Hold the presses! A U.S. Government interagency working group has just released its updated Technical Support Document (TSD) on the social cost of carbon (SCC). This is joyous news in some circles. 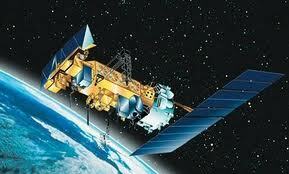 “The ‘Social Cost of Carbon’ Is Almost Double What the Government Previously Thought,” Climate Progress enthuses. Why are they pleased? Because the higher the SCC, the stronger the (apparent) case for suppressing the production and export of hydrocarbon energy in general, and for blocking the Keystone XL pipeline in particular. 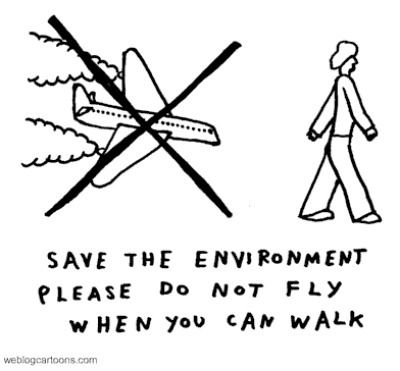 SCC is an estimate of how much damage an incremental ton of carbon dioxide (CO2) emissions does to humanity and the biosphere. SCC estimates are driven by assumptions about such issues as climate sensitivity (how much warming results from a given increase in CO2 concentrations), climate impacts (how warming will affect weather patterns and sea-level rise), economic impacts (how changes in global temperature, weather, and sea-level rise will affect agriculture and other climate-sensitive activities), and technological change (how adaptive capabilities will develop as climate changes). Modelers feed the assumptions into computer programs called “integrated assessment models” (IAMs). By tweaking those values, the modeler can get pretty much any result he desires. Outcomes also vary based on the discount rate selected, i.e., how much people are assumed to value income in the future compared to income in the present. Let’s cut to the chase. Those who say the SCC is bigger than the government previously thought merely recycle the old saw that climate change is “worse than scientists previously thought.” They are mistaken. 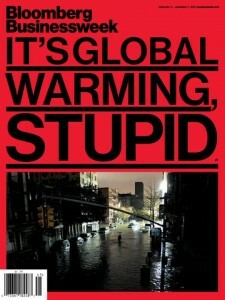 The climate change outlook is better than we have long been told. King et al. (2012): The rate of Antarctic ice loss is not accelerating and translates to less than one inch of sea-level rise per century. Faezeh et al. (2013): Greenland’s four main outlet glaciers are projected to contribute 19 to 30 millimeters (0.7 to 1.1 inches) to sea level rise by 2200 under a mid-range warming scenario (2.8°C by 2100) and 29 to 49 millimeters (1.1 to 1.9 inches) under a high-end warming scenario (4.5°C by 2100). If 21st century sea-level rise is more likely to be measured in inches rather than feet or meters, shouldn’t SCC estimates decline? And what about the 15-year period of no-net warming, which the climate science establishment did not predict and still struggles to explain? The warming pause is hard to square with the mantra of “worse than we thought.” It is evidence that the SCC is lower than they thought. 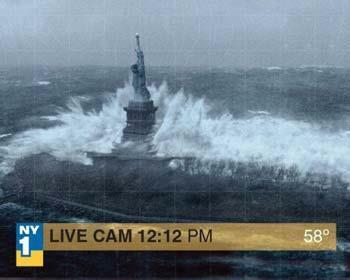 Part of the thinking here is simply that certain aspects of the storm (lowest barometric pressure for a winter cyclone in the Northeast) and its consequences (worst flooding of the New York City subway system) are “unprecedented,” so what more proof do we need that our fuelish ways have dangerously loaded the climate dice to produce ever more terrible extremes? The fact remains that there is 4 percent more water vapor – and associated additional moist energy – available both to power individual storms and to produce intense rainfall from them. Climate change is present in every single meteorological event, in that these events are occurring within a baseline atmospheric environment that has shifted in favor of more intense weather events. Anthony Watts makes this criticism on his indispensable blog, noting that as carbon dioxide (CO2) concentrations have risen, the frequency of hurricanes making landfall in the U.S. has declined. 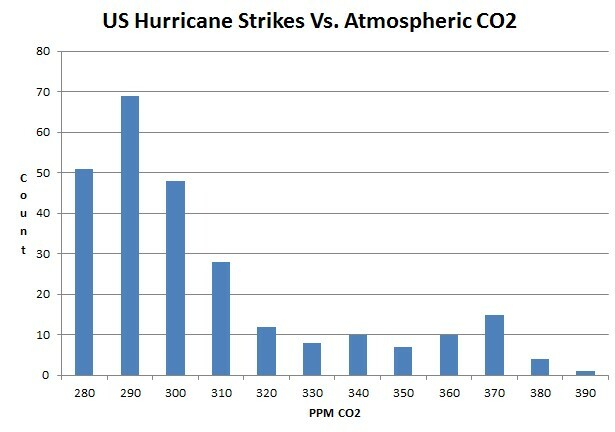 If there’s anything in this data at all, it looks like CO2 is preventing more US landfalling hurricanes. Well, I do agree that there is – the science is – is not settled on this. The idea that we would put Americans’ economy at – at- at jeopardy based on scientific theory that’s not settled yet, to me, is just – is nonsense. I mean, it – I mean – and I tell somebody, I said, just because you have a group of scientists that have stood up and said here is the fact, Galileo got outvoted for a spell. But the fact is, to put America’s economic future in jeopardy, asking us to cut back in areas that would have monstrous economic impact on this country is not good economics and I will suggest to you is not necessarily good science. Find out what the science truly is before you start putting the American economy in jeopardy. It’s one thing to question the economic impact and legacy of current climate policy proposals – you would expect and wish for politicians to debate this – but for a politician to question the science in this way is striking. . . .Note how he studiously ignored the moderator’s well-crafted question: who exactly are these “Galileos” that you believe have so comprehensively cast doubt on the canon of climate science? Perry couldn’t – or wouldn’t – name them. The Guardian makes a mountain out of a molehill. If Harris was so keen to know which climate scientists Perry finds most credible, he could have just restated the question. Perry was apparently more interested in making two basic points: (1) he does not view global warming as a warrant for imposing massive new regulatory burdens on the U.S. economy; (2) he is not impressed by appeals to an alleged “scientific consensus” because, after all, scientific issues not settled by counting heads. The question Harris asked is bound to come up again and again in candidate forums, and it’s a bit of a loaded question at that. Alarmists would like us to believe that any human contribution to climate change constitutes a “planetary emergency” (Al Gore’s phrase) and, as such, justifies the imposition of cap-and-trade and other assaults on affordable energy. Hence, they would like nothing better than to trick opponents into arguing as if the case against cap-and-trade, or against EPA’s hijacking of climate policy, hinges on the implausible thesis that greenhouse gases do not have a greenhouse (warming) effect.